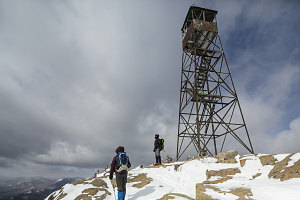 A rather cold Saint Patrick's day 2013 was the setting for an ascent of Hurricane Mountain from the north, via the Nun-da-ga-o ridge trailhead. I had never done Hurricane by this route, and wanted to give it a try. Starting off from the trailhead, we headed south to the Gulf Brook lean-to, where we then turned off onto the north trail to Hurricane. 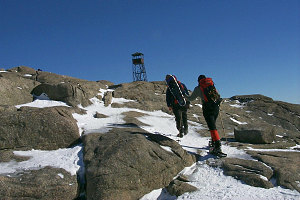 A quite hard snow base and a broken-out trail made ascending the route easy. Soon, we were at the small flat area just west of the summit blocks, where the southern and northern trailled routes meet. The packed path and help of gravity saw us quickly make a descent back to the lean-to, where we reverted to bare-booting, and then less than thirty minutes more brought us back to the trailhead. A perfectly reasonable (although slightly longer) alternative to the standard southern approach route to Hurricane. Beautiful Winter Day. Sunny and Calm. Not a whole lot of snow on the trail at first, but we wore snowshoes anyway. Higher up the trail was covered by a few higher drifts but nothing major. Excellent summit for such a low peak! Broad and open. Excellent views of Whiteface, with the ski runs sharply visible in white. Also good (albeit distant) views of the central high peaks region. 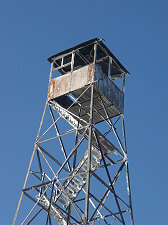 While we were on the summit, some fellow hikers scaled the old abandoned fire tower - seems like it is actually in pretty good shape (actually, there is an organization looking to save the tower from being dismantled, and you can view their website here www.hurricanefiretower.org). I had brought along some ice cream bars as a sort of joke, since it was February and you could do such a thing in February. Well, it turned out to be not cold enough and when we opened them at the summit they were half-melted and gooey... messy! All in all, an excellent peak - and so short!